ANU biologists are helping crayfish lead the campaign for fresher waterways along the west of Canberra. 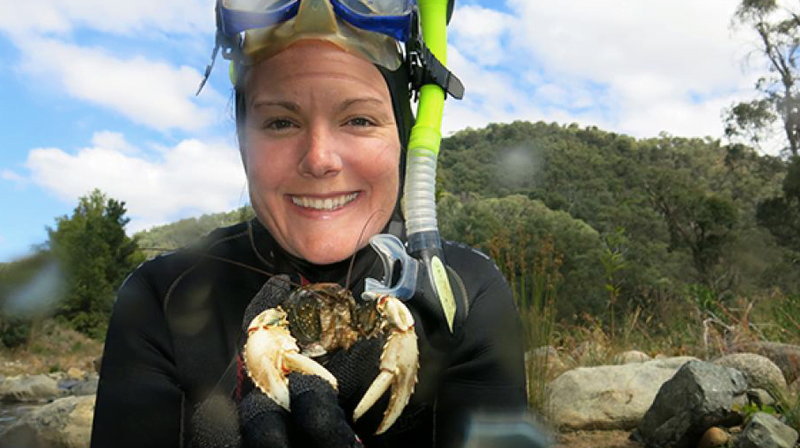 Biologist Dr Chris Fulton and Masters student Mae Noble have spent time snorkelling in the Goobarragandra River, in the high country west of Canberra, hoping to catch a glimpse of the Murray Crayfish. Six years ago, this was an idyllic stream of clear water gurgling over boulders, surrounded by shady trees. However, when Dr Fulton and Mae Noble arrived the trees were gone and only a muddy creek remained. Huge floods in 2012 had devastated the Goobarragandra, eroding the banks and choking it with silt. As the pair began searching for the iconic crayfish with its distinctive white claws, their fears were confirmed. The population had plunged by 95 per cent. “The ecosystem was sitting on the edge and the 2012 flood was the catastrophic event that pushed it over the cliff,” explains Fulton. Although floods like the one in 2012 only happen once or twice a century, clearing of vegetation on the stream’s edge had left the Goobarragandra vulnerable when flooding came. “Without the vegetation on the banks, the floods scour the banks. The sand and soil that should be held in place gets ripped away and deposited into the stream. The sunlight hits the stream and warms it up and it loses dissolved oxygen, which the crayfish are very sensitive to. The trees would have dropped twigs and leaves and insects which are food for all kinds of species, from bacteria up. So when you remove them it’s a triple jeopardy going on,” says Fulton. He believe the emergency is easily comparable with the threat to the Great Barrier Reef and is growing across the world. “Freshwater systems are considered one of the most vulnerable on the planet. We’re seeing the decline of so many things – crayfish, fish, waterbirds…It’s because fresh water is being squeezed from so many directions,” says Fulton. Agriculture and mining siphon off water, dams even out natural variations and cut flows to a tiny fraction of the natural levels. Amid these threats, Noble found a ground swell of hope for freshwater species while presenting the results of their research at a conferences. A series of talks on freshwater species, such as eels, caught her eye. One after another, traditional leaders from the US, New Zealand and Australia spoke, outlining the importance of their local freshwater species to their culture and how they were managed. Noble was struck by how the species that were culturally most significant to indigenous people were also the ecological most significant species. Meanwhile, Indigenous peoples of Australia’s management of freshwater eel species had extraordinary insights. “The Kooyong people of south west Victoria have cultural practices and ceremonies that have come out of their interactions with this species over thousands of generations. Their stories described how eels have adapted since the ice ages,” says Noble. In the Murray-Darling Basin, the local cultural traditions talk about how the Murray Cod created the basin. “That makes sense. The Murray Cod is the apex predator,” says Noble. Noble collaborated with her new contacts, resulting in a landmark paper in Ecology and Society, co-authored by herself and eight traditional owners from three countries. Environmental management agencies are also engaging with traditional owners with indigenous management skills, which gives Noble a lot of hope. As well as empowering traditional people, some governments are making serious moves in their own right to get freshwater systems back on an even keel. For example, the decline in US salmon numbers became such a concern, not only for the Indigenous Salmon people but the local fisheries and tourist market, that the US Government began destroying dams so salmon can travel the rivers again. In Australia, the Federal Government is poised to strike a blow in the push to return waterways to their pre-European state. In the last 50 years, as weirs and dams were added to create reliable water levels for human use, the Murray-Darling system has become progressively murkier and silt-choked, perfect conditions for European carp to flourish in. Fulton estimates carp now make up 80 per cent of the biomass in the Murray-Darling Basin. In the last 50 years, as weirs and dams were added to create reliable water levels for human use, the Murray-Darling system has become progressively murkier and silt-choked, perfect conditions for European carp to flourish in. However, Federal Science Minister Christopher Pyne announced that will in 2018 with “carp-ageddon”, the release of a virulent strain of carp herpes. “Suddenly, there will be literally hundreds of thousands, if not millions of tonnes of carp that will be dead in the River Murray,” Pyne said. While Fulton is optimistic about carp-ageddon, he does not think it will be the magic bullet. Isolated programs need to be united to rebuild ecosystems, he says. Fulton hopes the first place such complete plan will be implemented is near a hotspot of crayfish in the Murrumbidgee River where the new Canberra suburb of Thompson is planned. This article was adapted from the ANU Reporter. Featured image from the ANU Reporter.